Weleda Arnica massage oil is a plant-based oil made with biodynamically grown Arnica plants. As you may already notice, changes in temperature and the decrease of daylight affects your joints. Changes in barometric pressure seem to influence the pain levels of the joints. Either a cold front or warm front coming in can affect your ache, especially for arthritic conditions. But once the weather has settled in, your pain will even out. 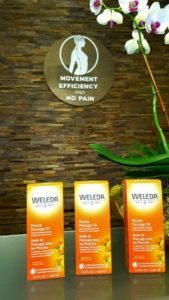 This fall we offer massage for arthritis with Weleda Arnica oil. However, there is limited research about the effects of massage on arthritic joints but the above-mentioned benefits have been widely reported. At the present times, the joint damage from arthritis can’t be restored surgically or by other means but we keep our hope in the future. What you do for preventing it to get worse is all it matters. The natural approaches to arthritic symptoms include regular massage therapy, anti-inflammatory diet, regular Epsom salt baths, exercise, yoga, swimming, use of Arnica oil. To increase the benefits of massage for arthritic conditions, we use Weleda Arnica Massage Oil. Arnica contains helenalin and related compounds, which are known to be involved in the anti-inflammatory action. The concentration of arnica in oils is much higher than in homeopathic remedies and thought, by some researchers, to be a viable explanation for an anti-inflammatory response. Moreover, Arnica Massage oil is also great for bruising, pain relief, healing, joint soreness and stiffness, sore muscles, muscle pain. We believe in natural healing. Do you?